Give your godchild something warm and snug on Dedication Day, Baptism, or during the Baby Shower! This baby swaddle blanket is inscribed with a scripture verse that helps add a protective and security blanket for your cute bundle of joy. The design and color is perfect for both baby girls and boys! 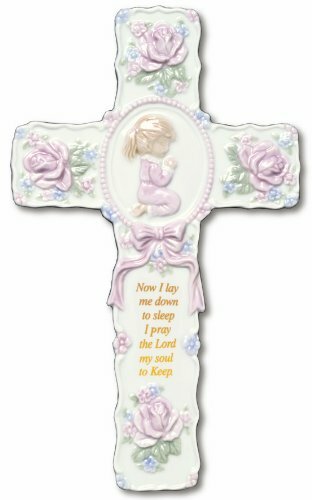 Looking for a unique but useful gift that you can give to expecting parents during a baby shower, or something that you can give to the baby during their special baptism, christening, or dedication day? Your search is over! 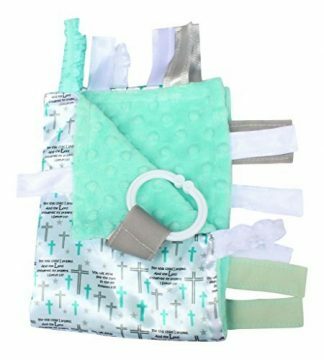 This baby swaddle blanket is the perfect gift for Christian families, and is a perfect way to welcome baby into the amazing Christian world! 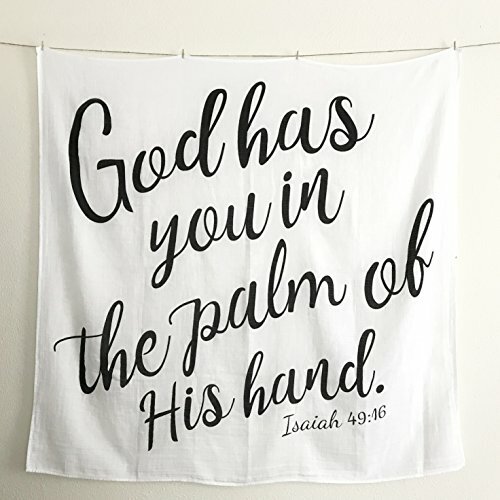 UNIQUE BABY GIFT: This verse is a beautiful reminder of God’s love for His children! 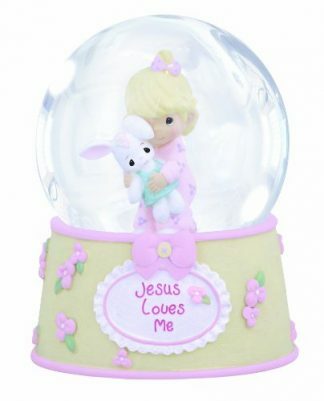 It’s the perfect Christian gift for a Baby Shower, New Baby, Baptism/Christening, Dedication, Easter, or Christmas. 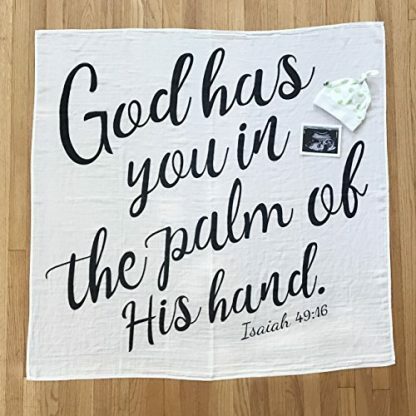 PHOTO PROP: Use your swaddle blanket for Baby’s Milestones, Pregnancy and Newborn Announcements, Delivery/Birth, or to celebrate his/her baptism or dedication day! NEUTRAL COLORS: The black and white coloring makes it perfect for both baby boys or girls! Our simple design will go with any nursery theme! These colors are also great for a visual stimulation in Newborns. 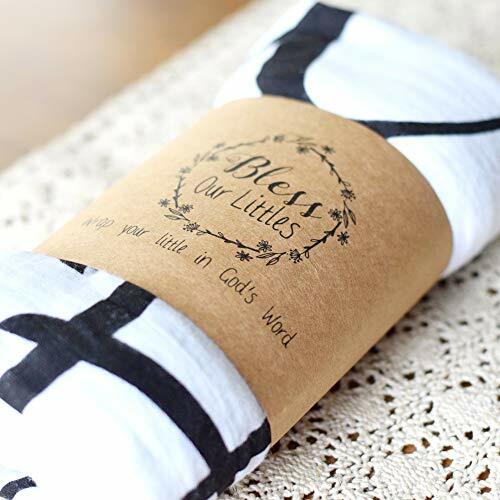 We have chosen 100% GOT Certified Muslin Cotton which is delicate for newborns skin. With a baby, it’s so important to have a blanket that’s machine washable. The material is so soft and only gets softer with use! DONATE: We donate $1 for every swaddle sold to help orphans and vulnerable children. VERSATILE: Since the blanket measures 47″x47″, it has so many different uses. Many moms use it as a nursing cover, a stroller shade, or as a play mat! This gift is perfect for godparents, grandparents, aunts, uncles, and cousins who are looking to welcome a baby boy or girl into this beautiful world. This swaddle blanket is not just useful for keeping baby snug and warm, but it is also great as a keepsake gift! SAFETY INFORMATION: If you decide to use this blanket for swaddling, be sure to follow the proper steps to do so. Causes of improper swaddling include SIDS and hip dislocation or hip dysplasia. Babies should be monitored so they don’t accidentally roll over.